Welcome to my personal web site. I hope you enjoy your visit and I hope that you leave feeling better than when you came.Since you’re here you probably would like to know a little about myself. Terrific! For that, I chose this image of the Portland Skyline as it’s story sums my personality pretty well, I think. First, as happens occasionally, I felt it was time for a “new adventure,” a new challenge. This time I wanted to pull together the new photography skills I learned over a few weeks. The picture you see above is considered a “High Dynamic Range Panorama.” The original consists of about 60 individual images and is 7′ x 9′ in it’s original size. Trait #1: Find the beauty of life through new ways to challenge and enjoy myself; life is really about stringing together as many pleasurable moments as possible. To plan the image I consulted my trusty Stellarium application–an astronomy program that lets you see what the celestial bodies are doing at any given moment. My silicon celestial guide told me that the moon would set in the West at roughly the same time that the sun was rising in the East. 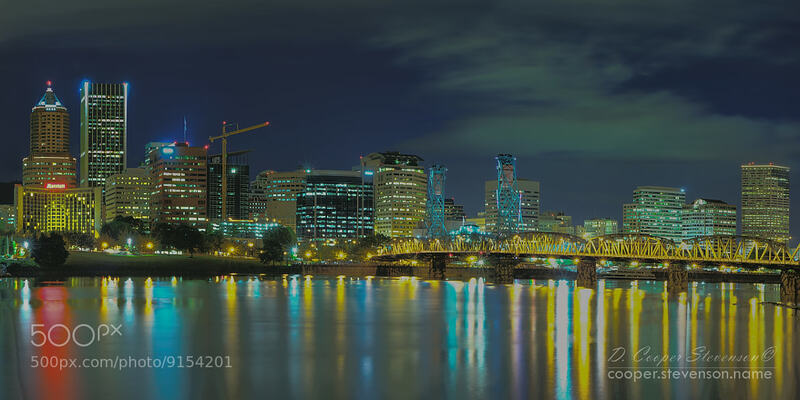 Given the Portland Skyline’s luster the image seemed like a natural fit. Trait #2: Planning is important. Perfect the art of preparation and strategical thinking. I then wrote computer instructions that automatically merged and normalized the images resulting in what you see here. Trait #3: If you have to do it twice, automate it; find more efficient ways to perform operations. Finally, I donated the rights to the image to “Free Geek,” a local charity that accepts donated computers and rebuilds them for kids. Trait #4: “Not to transmit your experience is to betray it.” (Elie Wiesel). Share. Communicate. Today I enjoy engaging in the Information Technology Industry. I specialize in large server installations including planning, resource management, and implementation. Most recently I created a system utilizing Artificial Neural Networks (ANNs) to predict securities’ price fluctuations. With every revision I get closer to my goal for highly dependable predictions. You can find out more about my ANN efforts in the Artificial Neural Networks section as well. Enjoy your visit and have a great day!